Whether you’re looking to clean up the garage or shed, save space in an apartment, or fit out your office or workplace, our Steadyracks are the versatile storage and bike parking solution you’ve been searching for. In fact, our Steadyracks suit almost any situation or location. 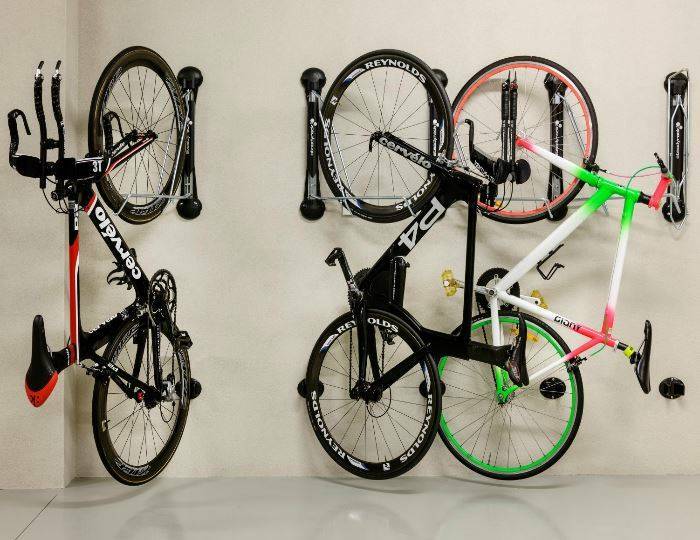 If you’re looking for bike storage, our Steadyracks are the only vertical bike parking solution that doesn’t involve any heavy lifting, doesn’t take up significant floor space, and unlike hooks or other bike racks, doesn’t damage your frame or rims. They also fold flat against the wall – which means they can be installed virtually anywhere! With its ability to store multiple bicycles of various sizes, the Steadyrack Classic Rack is the perfect storage solution for both families and business users. Thanks to its unique swivel action, you can store a number of bicycles side by side; bikes can be left in the central position or the rack can be swivelled to the left or right as the need arises. The rack is extremely simple to use and takes up little space, making it an all-round winner. No lifting - Simply balance the bike on its rear wheel and push it into the rack - there's no heavy lifting required. Balance your bike on the back wheel and push it into the rack Snug fit. Built to Last - Made from steel and UV treated plastic, our racks are strong and built to last, holding up to 35KG. Swivels almost 160 degrees from side to side Folds away. Simply fold up your rack when it is not in use and it fits snugly on the wall. 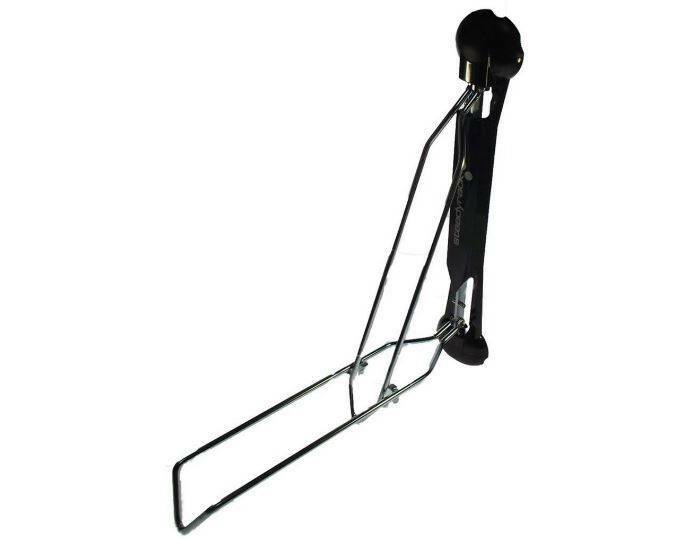 Saves Space - Unlike bike stanfs, hooks or pully systems, our racks have a unique 160- degress pivot feature. Safe & secure - Bikes fit snugly in the rack resting on the front tyre, avoiding the possibility of damaging the frame or rims. Frustrated with the current bike storage solutions available on the market, Steadyrack CEO David Steadman and his father-in-law, Ron, envisioned a rack that would meet the needs of every cyclist and bike owner across the globe; one that would save space, securely store bikes without damaging them, would be sturdy enough and easy to install, and most of all, wouldn’t require users to lift their bikes. And so, the Steadyrack Classic Rack was born! 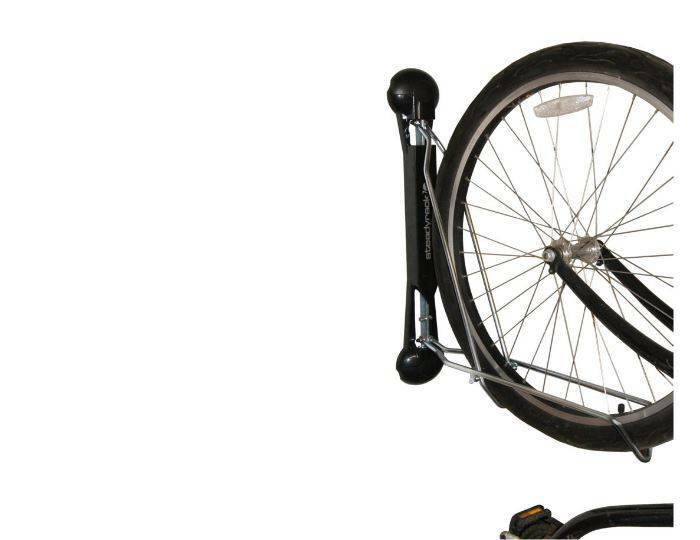 Accommodating for a wide variety of bicycles with wheel diameters up to 29 inches, bike owners can now safely and securely store their bikes with ease. Whether you’re looking for a storage solution for your family’s bikes, or for your own ‘family’ of bikes, the Steadyrack Classic Rack is the leading wall-mounted bike rack every home and cyclist must have.